An Evaporative air conditioner can use up to 90% less electricity than a refrigerated unit. Reduced power consumption reduces the amount of harmful greenhouse emissions entering our environment. An evaporative air conditioner is ideal for asthmatics, children and elderly because it continually circulates a fresh supply of clean, filtered air throughout your home. With over 20 years experience in both Domestic and Commercial Evaporative air conditioning, we specialise in providing correctly designed air conditioning systems with our own installation teams and after sales service. Thinking about these questions will help you determine your evaporative cooling requirements. Your specialist dealer will also be able to provide you with further information on each of these areas. How big an area do I need to cool? Take into account the size of the area and how many rooms you will be cooling, you will need to select an evaporative air conditioner model that has the capacity to cool the complete area. Speak to us and we will come out to your home to quote or quote from your home plans. What level of quality evaporative air conditioner are you looking for? Evaporative air conditioners vary in quality and the features they offer. Consider that a more expensive model may have extra features that may be quieter, save on running costs or save water. Keep in mind that the higher quality system you select the less likely that you will need to service it as often. How important are running costs to you? Evaporative air conditioners vary in energy efficiency, meaning that over a year, the running costs can vary significantly. 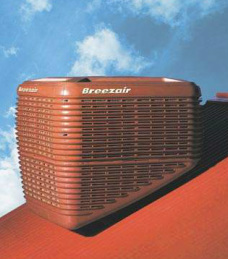 Breezair is the only evaporative air conditioner which features an Inverter, which eliminates the wasteful and costly stop-start-stop sequence of older systems generating greatly reduced energy use and genuine cost savings. Is the purchase price the biggest consideration? Evaporative air conditioners vary in price and quality. Consider that a more expensive model may have extra features that may be quieter, save you money on running costs or save water. Weigh up the positives and negatives of each system in relation to the purchase price. Will noise bother me or my neighbours? Some evaporative coolers are noisier than others. Many feature an axial fan which moves the air in a circular motion through the ducts, and can create turbulence and noise. Evaporative air conditioners with centrifugal fans are generally quieter, as they move the air in a straight line. Some evaporative air conditioners are more energy efficient than others. Ask us which is the most energy efficient, therefore reducing the impact on the environment. Consider whether it may be worthwhile to insulate your home to keep your home cool and reduce the amount of cooling you require, therefore reducing the running costs for cooling. At CDA we also supply and install Roof Insulation. "Job well done boys, very professional, neat and tidy, system working perfectly"
"It was a great job on everyone's behalf and the process from quoting through to installaion couldn't be faulted"
"Very pleased with the work and air conditioner working well. Thanks." · Invertacool™ cleverly manages power consumption and eliminates the wasteful and costly stop-start-stop sequence of old-fashioned systems generating greatly reduced energy use and genuine cost savings. · Refrigerated systems with inverter technology use less electricity than those without inverter, but still use a significant amount more electricity than Breezair evaporative air conditioners. 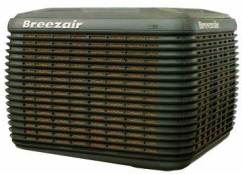 · A Breezair Icon series evaporative air conditioner uses up to 90% less electricity than refrigerated units (including split systems and reverse cycle air conditioning) and up to 40% less electricity than conventional ducted evaporative air conditioning systems (without an inverter).